Hello! I absolutely love week in photos posts so thought I would post one of my own! These photos are just off of my phone but I do have instagram and I am going to start posting more photos on there so if you would like to follow me then my name is beautybeckyblog. 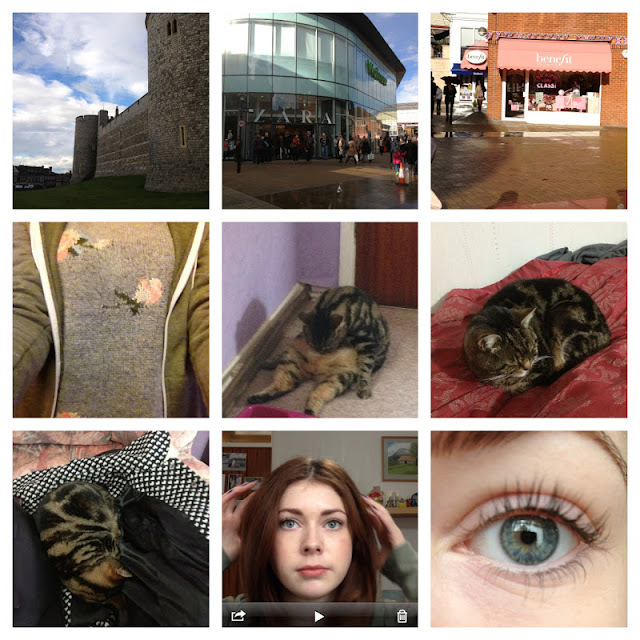 Windsor Castle // Big Zara and Topshop in Windsor so I did some shopping // Benefit store! // My new jumper and hoody from Topshop // My cat cleaning her tummy looking more flexible than me! // My old cat is so cute // Snuggled up on my coat // Screenshot from a video I filmed but will probably never upload! // Taking a photo of my eye to try and see how long my lashes are with no mascara! What have you been up to this week? I'm off to London in a week and I am so excited! I will take lots of photos! I love Windsor Castle! :) Your 'Week In Photos' post is much more exciting than mine! hey dear thanks for sharing your blog with me via twitter! I spot a Zara store in your pictures, oh how I love Zara! you have amazing eyes!!! Lovely blog sweetie, I hope you can stop by mine someday and tell me what you think! PS: loving the bobbi brown shade in one of your latest posts! Ooh I love Zara too! It's one of my favourite stores :) thank you so much! I love windsor castle, and seeing that shop benefit makes me want to go and look at all the pretty make-up inside. Love your blog already you have done some great posts!. Haha I know! She's a funny one :) Thank you!